To solve crosswords you do not need to buy any newspapers and magazines. Moreover, there is no need to spend money buying collections of crossword puzzles in other applications. 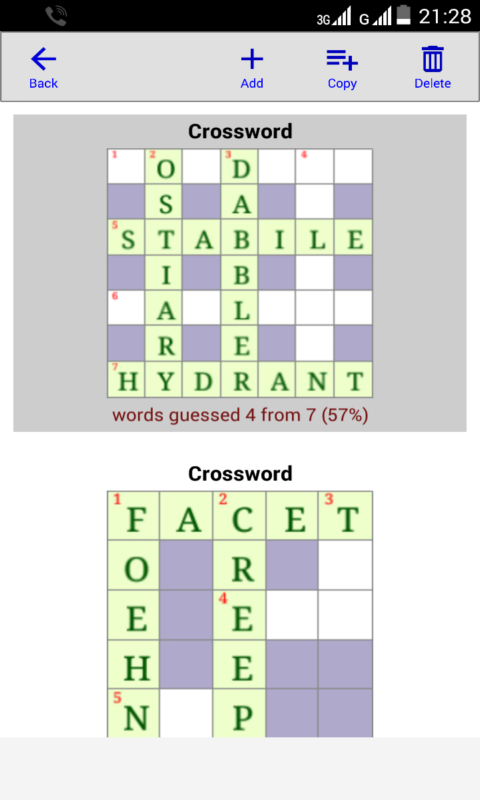 The Crossword Constructor will make as many crosswords as you want just in a few seconds and, if needed, solve them. You can solve a crossword just immediately after it has been created. It is also possible to save it to a file and then call it in again. In addition, you can print it out and take with you to solve it traditionally: with a pencil in hand or get all the answers and publish the crosswords in a newspaper or magazine. You will not be bored because the application will not repeat the previous one crossword. An unlimited source of crosswords is in your hands. The game control is absolutely easy and user-friendly. Just run and play.